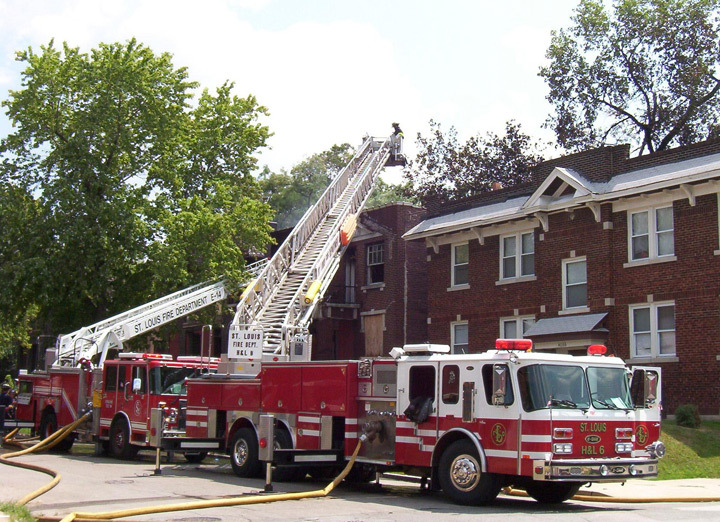 The St. Louis Fire Department recognized that in many cases the 75 foot aerials would not suffice, so the department still operates 4 conventional ladder companies -- or as they refer to it: Hook and Ladder Company. H&L6 is an E-One 100' platform which was purchased as a demo unit. St. Louis is a commuter city with a daytime population of 1 million. The department operates 30 quints, 4 hook and ladders and 2 squads, broken down into 6 battalions or districts. The STLFD also operates 14 ALS ambulances. Department staffing is authorized at 1,000 members but a current hiring freeze has leaves STLFD with 900 firefighters and paramedics. The empty slots are filled in by firefighters working overtime on what is normally a 24 on - 48 off cycle.